The Model 2800 Frontliner with A to D Converter from SPL, is a modular recording channel packed with a number of SPL's top processors. The flagship of SPL's channel strips, its processing stages can each be inserted into studio environments or DAWs like analog plug-ins. The Frontliner has a number of useful processing tools on board to record and process vocals, instruments, and recorded tracks as it merges a preamp, a de-esser, an EQ and a compressor in one processor-packed unit. Thanks to its individual analog I/Os, all these powerful, analog processors can be inserted into any studio by the Frontliner pilot, making them suitable for use during mixing and mastering. Thus, the Frontliner is not reduced to being only a front end device, as even DAW-based studios get the opportunity to integrate analog processors of the Frontliner at almost any stage of the audio production process. The hybrid preamp with a discrete transistor stage and separate tube stage, combines performance and neutrality with the option for sound coloration by enhancing the harmonic content with the switchable tube drive. The one-knob de-esser employs a phase cancelling technique to reduce sibilants. With three bands, the EQ section covers the complete audible frequency spectrum, and a tube saturation control applies distortion to any signal from warm and subtle to reckless levels. The compressor offers many classic parameters and controllable automation of attack and release which adjusts the setting of time constants to the input signal. Many of the modules on the Frontliner were originally developed for a number of previous SPL processors such as the Track One and Channel One, the DynaMaxx compressor/limiter and the SPL De-Esser. The development of new units in the last years facilitated the need to conceive a new channel strip. Now, you can find these in one, more compact, but very potent processing package. Now the Frontliner comprises the same discrete, hybrid semiconductor/tube preamplifier design like the GoldMikeMK2. 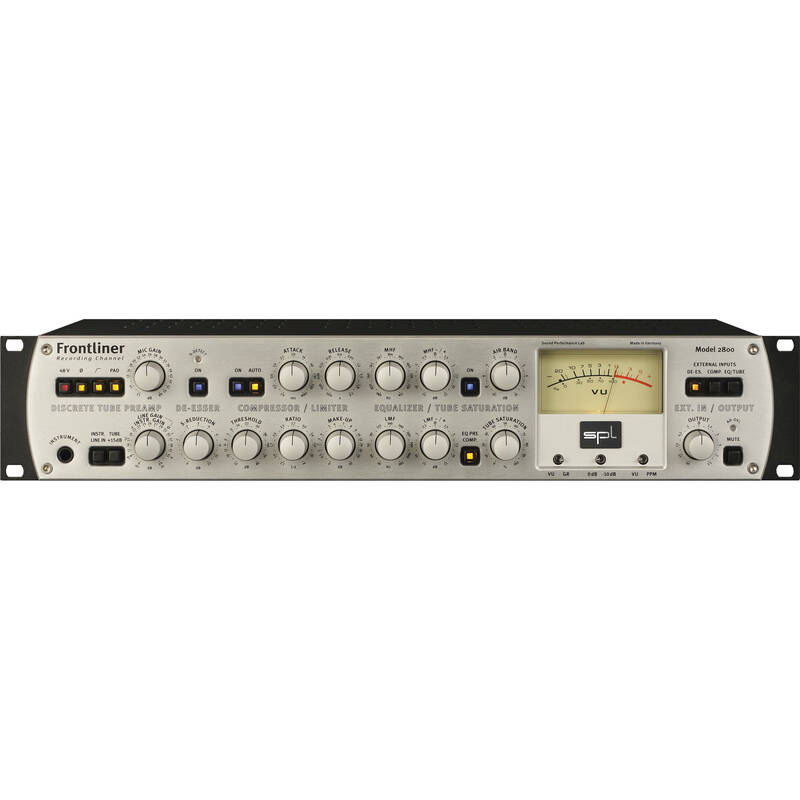 The compressor module is based upon the Kultube providing a full set of classic controls. The Kultube's highlight, a signal-dependent automation of attack and release parameters which can still be influenced manually, has also been integrated. With this option, manual and automatic control can be merged to always find the best settings. The EQ section provides two semi-parametric filters for low and mid band as well as a bell filter delivering the top end. This filter set offers a frequency first aid kit and is rounded off with a Tube Saturation control. In contrast to semiconductors, a tube does not clip from a certain level, but approaches its limits by increasingly producing harmonic distortions. The sound effects from saturating a tube can often be used to improve the audio signal. The sound results resemble tape saturation effects and increase the density and perceived energy in a pleasing way. The task of a channel strip is relatively complex. There is not one specialized device for one job, but a unit that combines a lot of technology for the preamplification and processing of audio signals. The Frontliner benefits from SPL's earlier and present innovations for targeted, efficient work. The SPL De-Esser, for example, performs highly complex processing, but can simply be adjusted with one single knob. And the straight and clear front panel design supports faster and safer operation. One result of SPL's development of modular concepts is the RackPack series: a RackPack frame hosts up to eight 3U high modules for free placement and (inter-) connection. The same modular idea has been transferred to the Frontliner. Each Frontliner disposes of its own set of inputs and outputs. Switching options allow to integrate Frontliner's modules into a studio environment as if they were stand-alone devices, each processing module having its own set of inputs and outputs. You can also group modules in any combination and you can determine inserts at each module's input. If you imagine the Frontliner modules as analog plug-ins, the additional value suddenly becomes apparent: this channel strip also is a versatile analog processing station. With one single unit, especially DAW-based studios benefit from a recording front-end and have access to analog processors for the main signal processing tasks. The Analog/Digital Converter Module 1090 is the digital output section of the Frontliner with a plug-and-play design for easy installation. It offers an S/P-DIF output with both coaxial and optical connectors in parallel. The heart of the module is a 24-bit converter with a variable sample rate of up to 192 kHz. Quartz oscillators help ensure a clean, low-jitter master clock. The internal sample rate can be switched between 44.1, 48, 88.2 and 96 kHz. Other sample rates (32, 176,4 and 192 kHz) are set by external syncronization. The converter can be synced to other digital devices via a S/P-DIF input. The internal oscillators are automatically disabled when an external clock signal is present to prevent interference. An extremely effective voltage stabilizing circuit ensures that the converter continuously receives sufficient and stable voltage - an important prerequisite for clean, transparent audio. The compact design minimizes the signal path to the converter. Grounding surfaces on both sides of the circuit board effectively reduce interference and ensure optimal separation between analog and digital components. Three separate, individual inputs for microphones, line signals and instruments. Discrete semiconductor/tube hybrid preamplifier to combine the advantages - dynamic range and low noise operation of semiconductors with the musical qualities of tube sounds. 250 volts tube circuits in the preamplifier and for tube saturation stages. The differential stage compressor eliminates side effects and the half load per VCA reduces THD. The operational amplifiers for the compressor circuitry meet military specifications. Central star ground wiring scheme minimizes influences that could affect the ground paths. The power supply is built around two toroidal transformers. Can 2 Frontliners be connected for stereo operation of the processing modules? Unfortunately the Frontliner is designed as a single channel unit with no linking features for dual or stereo operation.